2560 x Austria - nice inventory in four large albums accommodated, as well an extensive used collection clean formed from 1945 / 79 in the illustrated album including happy childhood 1949, Carinthia set 1950, master builder 1951 and many further issues, complete volumes and so on, as well also older issues, plate flaw, as well numerous mint never hinged issues including complete volumes. Favorable! 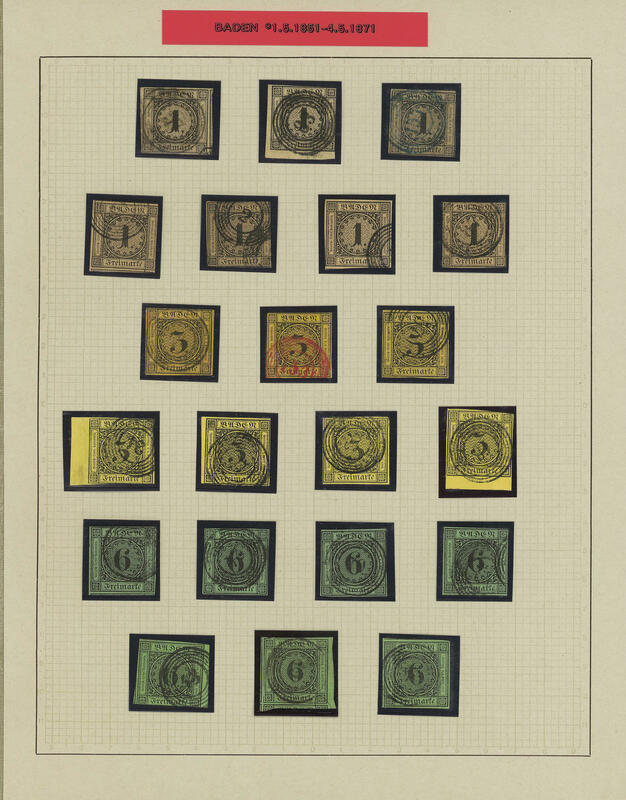 2581 Austria - 1945 / 69, very nice mint never hinged collection, in the number of a major listing complete, in the Lindner hingeless printed form ring binder. Also the not issued Hitler Mark values with grid overprint, Grazer overprints complete including the Mark value, all fours Renner-sheetlet, happy childhood 1949, Carinthia set 1950, master builder 1951, bird series 1953 and so on. A very nice quality object! 2682 Austria - 1945 / 94, nice mint never hinged collection except for very few values complete in two lighthouse hingeless printed form albums. With also happy childhood 1949, Carinthia set 1950, master builder 1951, bird series 1953, folk costumes set and so on. A maintained object! 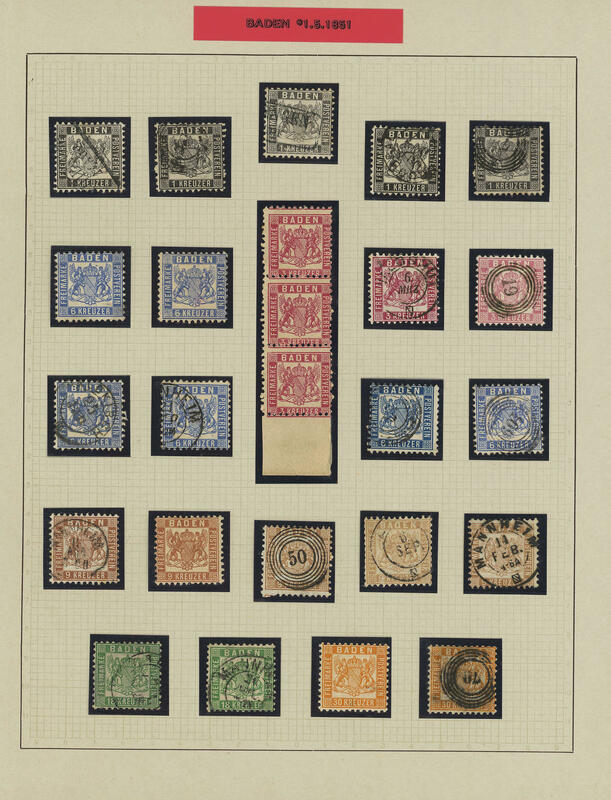 2713 Austria - 1945 / 91, extensive mint never hinged collection, nearly complete in two Lindner T hingeless printed form ring binder with numerous complete sets, volumes, better issues including happy childhood 1949, Carinthia sentence 1950, master builder 1951, bird series 1953 and so on. A very nice object! 3367 /⊙/ Austria - interesting and extensive lot in a box accommodated on stock cards, as well numerous better issues, good sets from the thirties, better overprint items and so on. Perfect for liquidation! 1462 Azores / MADEIRA - 1980 / 99, nice and extensive mint never hinged collection with many complete sets and souvenir sheets, as well additional stamp booklet, clean in two large stock books formed. Very favorable! 1633 ⊙ Azores - 1980 / 91, nice used collection, complete from the subscription supply on KABE hingeless preprinted pages. 1635 Azores - 1980 / 81, nice mint never hinged collection, complete with all issued stamps and souvenir sheets, as well also stamp booklets. Favorable! 4B ✉ BADEN - extensive inventory from covers packed in a carton. 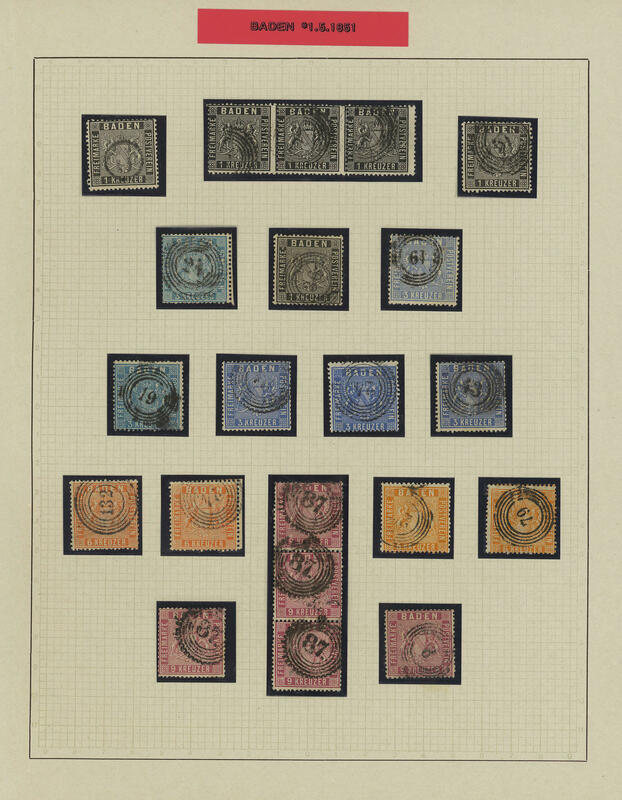 Thereby many interesting documents, mostly the pre-philately from 1721 with numerous different locations, mixed postmark types, as well also stamped documents and postal stationery. Perfect for liquidation! 9L ✉/⊙/ / BADEN - interesting lot housed in two stockbooks, as well nice pre philately covers with a very good part from Offenburg, as well also stamp issues abundant with unperforated and perforated values, mixed quality, franked covers and letter pieces, as well also French zone Baden including better issues and so on. Please have a look! 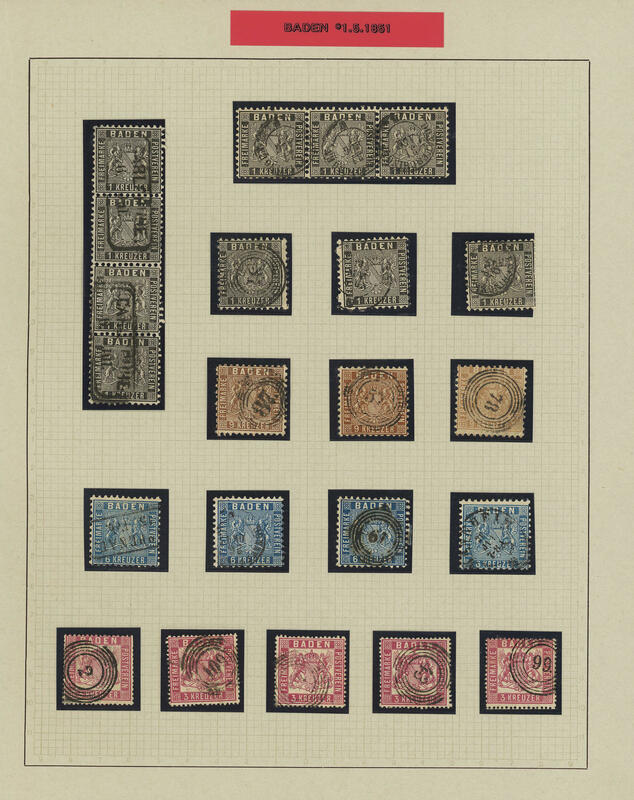 78 ⊙ 1, 12, 16 BADEN - superb collection clean mounted on pages made up, almost exclusively used collected, condition varies, with numerous superb and extremely fine copies. Many particularly beautiful examples, colors, shades, better cancellations and so on. With also seven examples the Michel no. 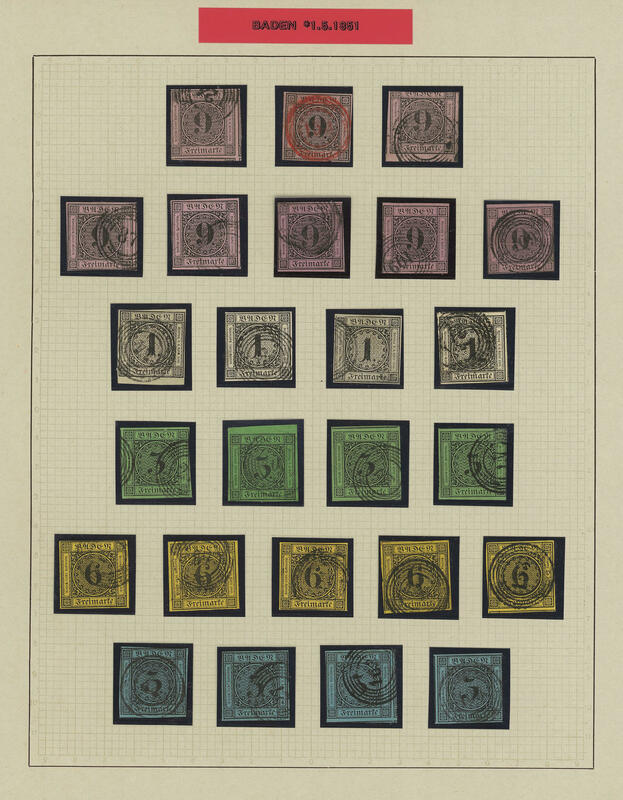 1 in a respectively b-colour including one rarely corner of the sheet centric cancellation, the further cut values very fine occupies including many particularly beautifuln copies, margin copies, as well the perforated issues outstanding occupies, as well Michel no. 12 in the rare used strip of three, 13 an in the rare used strip of four, Michel no. 16 with five used copies, the 18 Kr. Used twice, 30 Kr. Used and so on. An extraordinary collection with substance!